Approximately 40 million pounds (nearly 90 percent) of the nation's lobster supply is caught off the coast of Maine. Lobsters have been know to reach 3 feet in length and weigh over 40 pounds; lobsters of this size are estimated to be at least one hundred years old! Lobster are trapped off City Island in New York City (more than 20 lobstermen with over 6,000 traps). Called locally 'Bronx Lobster' or 'Long Island Lobster', they are smaller, browner and not as sweet as other American lobster ('Maine lobster'). The Pilgrims thought lobsters were ugly, and considered them to be poor man's meat. In the 1880's the wholesale price of lobster was less than ten cents per pound. 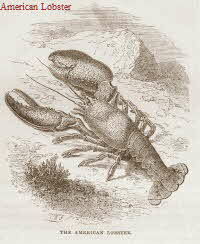 In 1884 there was a record catch of Maine Lobster of 24 million pounds. 2002 was also a record catch - 63.6 million pounds of lobster were trapped in Maine waters. Sonya Thomas won $500 and a trophy belt at the World Lobster Eating Contest in Kennebunkport, Maine (8/22/2004). She ate 9.76 pounds of lobster meat (38 lobsters) in 12 minutes. She also holds the record for hard boiled eggs, and pork & beans (8.4 pounds in 2 minutes 47 seconds). She is 36 years old and weighs only 105 pounds.